NTP reflection attacks across the Internet. NTP is the Network Time Protocol, it is a relatively obscure protocol that runs over port 123 UDP and is used to sync time between machines on a network. If you have ever set up a home computer or server and been asked which time server you want to use, that is an NTP connection. NTP is one of those set-it-and-forget-it protocols that is configured once and most network administrators don’t worry about it after that. Unfortunately, that means it is also not a service that is upgraded often, leaving it vulnerable to these reflection attacks. How do NTP reflection attacks work? Similar to DNS amplification attacks, the attacker sends a small forged packet that requests a large amount of data be sent to the target IP Address. Most scanning tools, such as NMAP, have a monlist module for gathering network information and many attack tools, including metasploit, have a monlist DDoS module. How can you protect your servers? The easiest way to update to NTP version 4.2.7, which removes the monlist command entirely. If upgrading is not an option, you can start the NTP daemon with noquery enabled in the NTP conf file. This will disable access to mode 6 and 7 query packets (which includes monist). By disabling monlist, or upgrading so the the command is no longer there, not only are you protecting your network from unwanted reconnaissance, but you are also protecting your network from inadvertently being used in a DDoS attack. Authentication of Domain Name System (DNS) names for Transport-Layer Security (TLS) endpoints is a core security challenge in many Internet protocols, most famously Hypertext Transfer Protocol (HTTP). Today, the cryptographic bindings that underlie TLS authentication are asserted in Public Key Infrastructure for X.509 (PKIX) certificates issued by third-party certification authorities (CAs). The DNS-based Authentication of Named Entities (DANE) working group is developing protocols that allow certificates to be bound to DNS names using Domain Name System Security Extensions (DNSSEC). 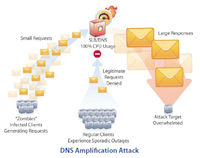 A DNS amplification attack is a type of distributed denial of service (DDoS) attack that takes advantage of the fact that a small DNS query can generate a much larger response. An attacker can direct a large volume of network traffic to a victim’s system by initiating relatively small DNS queries. The attacker spoofs the IP address of the victim to reflect the network traffic using the DNS server. This makes it difficult to trace the attacker. In order to launch a DNS amplification reflection attack the attacker needs to perform two tasks. First the attacker spoofs the address of the victim. This is the reflection part, it will cause all the reply’s from the DNS server to be directed to the victim’s server. This can easily be done since in UDP no handshake (like in TCP) is being done between the client and the server. Secondly the requester searches for responses that are several times bigger than the request. The attacker achieves an amplification factor because the response is many times larger than the request. The amplification can even be larger when DNSSEC is used, because of the signatures used the size of the response increases. At its heart, an X.509 PKI is a security architecture that uses well-established cryptographic mechanisms to support use-cases like email protection and web server authentication. In this regard it is similar to other systems based on public-key cryptography, for example OpenPGP [RFC 4880]. In the realm of X.509 however, and thanks to its roots in a globe-spanning scheme devised by the telecom industry, these mechanisms come with a fair amount of administrative overhead. One thing to keep in mind is that X.509 is not an application, but a specification upon which applications like Secure Multipurpose Internet Mail Extensions (S/MIME) and Transport Layer Security (TLS) are based. The building blocks are very generic and derive most of their meaning from the relations that exist/are established between them. It’s called an infrastructure for a reason. Visit: PKI tutorial to learn more about PKI.